Simply call 970-350-9220 and make an appointment to visit the Meeker Home Museum, the 1870 home of Greeley’s founding family. Listed on the National Register of Historic Places, this unique two-story adobe brick home was built for Nathan Cook Meeker, his wife Arvilla, and their daughters Mary, Rozene, and Josephine. In 1929 the home became Greeley’s first museum. This restored home contains cherished artifacts including furnishings original to the home and used by the Meeker family. A 10-foot tall diamond dust mirror, tall case clock and Meeker’s cherrywood desk are some of the prized historical treasures within the museum. During a guided tour of the museum, visitors learn about Meeker’s life as an agricultural editor, his success establishing a Utopian temperance and agricultural community in the west, and the circumstances that led him to become an agent at the White River Ute Agency in northwestern Colorado. Visitors also learn about his untimely death in 1879. Aside from taking a guided tour of the home, visitors can also walk the grounds of the museum, where interpretive panels portray historical facts, maps and images about the town’s history, Horace Greeley and the Meeker family. Call 970-350-9220 to schedule a tour of the museum. Members receive free admission. Join today! *Prices for special events and programs may vary. The first floor is handicap accessible and the second floor is accessible by stairs. A short video of the upstairs area is available. Groups of ten or more can schedule a tour of the Meeker Home Museum. The museum is located between Cheyenne, WY, and Denver, CO, making it the perfect destination for your next group tour or field trip. Whether you’re planning a day or an overnight trip, our museum offers great educational and entertainment opportunities. Let us help customize your next tour experience in Greeley. In October 1869, Nathan Cook Meeker visited the Colorado Territory and other western states on a reporting assignment. He was impressed with the spectacular beauty and natural resources of Colorado. Before he returned east, Meeker was dreaming of a new home in the American West. Meeker’s dream of a Utopian farming community came to fruition in April 1870 when several hundred colonists arrived and established a new town near the confluence of the Cache la Poudre and the South Platte Rivers. 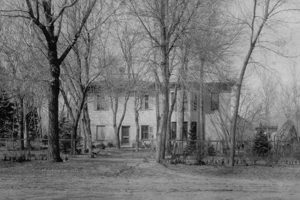 Today the home of Greeley’s founding family stands in its original location and serves as a testament to Meeker’s dream. This image of the Meeker Home shows an 1884 addition on the side of the home. The addition was removed in 1958-59 to restore the home to its original 1870 appearance. Photography: Non-flash photography welcome except in special exhibitions. No tripods or selfie sticks allowed. Commercial photography allowed with prior permission from Museum Manager. City ordinance does not permit smoking, including electronic cigarettes and other vaping devices, in the museum or within 25 feet of any of the building entrances. Please silence electronic devices while in the museum. Error: Error validating access token: Session has expired on Friday, 10-Aug-18 08:53:44 PDT. The current time is Monday, 22-Apr-19 05:43:31 PDT.